ABSOLUTE BATMAN: YEAR ONE presents one of DC Comics' most lauded tales in two hardcover volumes contained by a slipcase. The first volume will reprint the recolored version of the story from previous collected editions, remastered with new, high-resolution scans of the original coloring by David Mazzucchelli and Richmond Lewis. 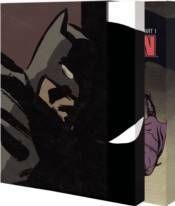 The second volume will reprint the original 1987 version of the story as it ran in BATMAN #404-407, reproduced from scans made by Mazzucchelli and Lewis from the printed comic book pages, presented on stock that simulates the look and feel of the original comics. This volume will include Miller's complete scripts and Mazzucchelli's complete pencil layouts for all four chapters! Together, the two volumes will include more than 60 pages of bonus material, including everything seen in the existing hardcover and trade paperback collections.